One of my Sicilian aunt’s favourite ways to cook rabbit in Ragusa was Cunnighiu a Pattuisa (cunnighiu is coniglio in Italian, rabbit in English). I did some research and found that two other Sicilian food writers call it something different: Giuseppe Coria calls it Cunnighiu a Portisa, and Pino Correnti Cunnighiu a Portuisa. In Italian this becomes, alla Portoghese, that is in the Portuguese style. I am not quite sure why the Portuguese are accredited for this recipe, but one can assume that it is because of the Spaniards in Sicily. Sicily was ruled by Spaniards at various times by: House of Aragon (1282–1516), Kingdom of Spain (1516–1713), Duchy of Savoy (1713–1720), Habsburg Monarchy (1720–1735) and Kingdom of Naples (1735–1806). Located on the southwestern tip of the European continent in the Iberian Peninsula are Spain, Andorra and Portugal and Portugal only gained independence from Spain in 1640. Olive oil, olives and capers are used extensively in Sicilian and Spanish cooking. There are various versions of this recipe for rabbit cooked in the Portuguese style as cooked in Ragusa and most seem to contain green olives and capers. Some contain vinegar, others white wine. Some recipes suggest adding a spoonful of tomato paste (mainly to enrich the colour), some add a little sugar, others chilli. I cooked a version of this rabbit for friends in Adelaide, the photos tell the story. In a fry pan I browned 1 rabbit in about ½ cup extra virgin oil. I sectioned the rabbit into 5 pieces (number of pieces is optional). I then added some salt and pepper, some green olives and capers, 2-4 cloves garlic and some fresh thyme. Sicilians would use a few fresh bay leaves. If you are using salted capers make sure to rinse them and soak them in several changes of fresh water. I then added about 1 glass of white wine mixed with ½ cup of white wine vinegar. I covered it with a lid and cooked it slowly on low heat. *If it is a tender rabbit and if it is cut into small enough pieces, the rabbit may be cooked by the time all of the liquid has evaporated. If the rabbit is not as young or as tender as you had hoped, and you feel that it needs to be cooked for longer add a little water, cover with a lid and simmer it gently until it is soft – keep on adding more wine and water. I partly cooked some potatoes and placed them with the rabbit for the last 20-30 minutes of cooking. The green leaves are mint. These add colour and taste: Ragusani use quite a bit of mint in their cooking. No exact quantities, just like an Italian. You can tell from the photos how easy it is to make Caponata Palermitana. Unlike Caponata Catanese there are no peppers (capsicums) in this caponata but the rest of the ingredients and processes for making any caponata are the same. I used 2 egglants. Cooked each separately as I did not want the frying to be overcrowded. I use salt when I am cooking and not after the dish is cooked. I always use extra virgin olive oil. A good heavy saucepan is good to use. After the eggplants, sauté the onions and the celery. I used 1 large onion, 2 sticks of celery and some of the tender leavesof the celery. Add some salt. When the onions and celery have softened to your liking, add green olives and capers. I made a space in the centre of the saucepan, added a couple of teaspoons of sugar. Melted that and added about a quarter of a cup of red vinegar and evaporated it. I made another space in the centre and added about 1/3 cup of passata. Cooked it – you can see that there is very little liquid left. Time to add the eggplants and combine all the ingredients. This time I will decorate the caponata with fried breadcrumbs (day old bread mollica) toasted in a frypan with a little olive oil. I could decorate the caponata with toasted pine nuts or almonds but I think the bread will add crunch but not too much taste so as not to compete with the eggplants. At this time of year, egglants are of excellent quality. Mint rather than basil appealed to me more on this occasion. There are numerous recipes for caponate (I can spell, it is the plural of caponata). Use the search button. A zucca in Italian can be an overgrown zucchino (singular) or a marrow, therefore to differentiate a pumpkin from a marrow a pumpkin is called a zucca gialla (yellow). Not all Sicilian caponate are made with eggplants. For example there are celery, fennel, potato caponate and pumpkin can also be used as the main ingredient (Caponata di zucca gialla). The principle for making any caponata is the same: onion, celery, X ingredient (eggplant or eggplant and peppers, fennel, potato etc. ), capers, green olives, sometimes a splash of tomato puree, toasted pine nuts, or almonds and agrodolce – caramelised sugar and vinegar. The ingredients a fried separately. Pumpkin first – sauté and then set aside. Sauté onion and celery. Add olives and capers. Add sugar, then vinegar and salt to taste. Add the fried pumpkin and toasted almonds (or pine nuts). Let rest overnight or for at least half a day. The other popular Sicilian way to cook pumpkin is also in an agrodolce sauce. For this recipe, slices of pumpkin are also fried. I bake mine and it is not the traditional way of cooking it. 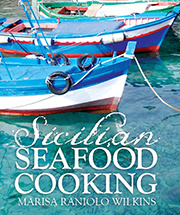 The recipe book you can see in the background of the photo below is Sicilian Seafood Cooking – now out of print. Use the search button to find other recipes for making a caponata on my blog. Albacore tuna is sustainable, cheap in price and much under rated in Australia. It is not sashimi grade so the Asian export market does not want it and therefore in Australia we also tend to undervalue it. It is denser in texture but still excellent for cooking (lightly or cooked for longer). As in Australia, Blue fin tuna is the preferred tuna in Sicily; if it is sustainable depends on how and where it is caught – it should be wild caught and aquaculture is not an option. Unfortunately I rarely find albacore tuna where I live in Melbourne and if I do, I always grab it when I can and cook it as I would cook blue fin tuna. I like tuna seared and left rare centrally but my Sicilian relatives eat tuna very well done and this is also how it is presented in the traditional home-style restaurants in Sicily. In Sicily there are numerous ways tuna but Tonno alla stemperata is one of the favourites in the south eastern part of Sicily. It was first cooked for me by one of my cousins, Rosetta, who lives in Ragusa. She and her husband have a holiday house on the beach at Marina di Ragusa, and she usually buys most of her fish from the fishermen on the beach. Although Rosetta prefers to use tuna in this recipe, any firm-fleshed fish, thickly sliced, is suitable. She prefers to cut the tuna into large cubes – this allows greater penetration of the flavours in the sauce and of course, it will cook to a greater degree and more quickly. Rosetta cooked the fish in the morning and we ate it for lunch, at room temperature…in Australia you may find this unusual but eating it at room temperature and some time after it has been cooked allows the flavours time to develop. 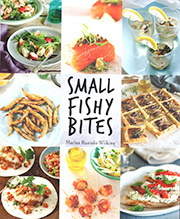 A version of this recipe is also in my first book: Sicilian Seafood Cooking. I have used Albacore tuna, trevally, mackerel or flathead (better choice category) successfully in this recipe. Soften the onion and celery in about half of the extra virgin oil, and cook until the onion is golden, about 5 minutes, stirring frequently. Add the fish, olives, capers, seasoning and bay leaves and sear the fish. The pieces of fish only need to be turned once. Add the vinegar and allow the vinegar to evaporate and flavour the dish. Remove the fish from the pan if you think that it will overcook and continue to evaporate. Optional: Decorate (and flavour) with mint just before serving. You can tell I am in South Australia by some of the photos of the fabulous varieties of fish I am able to purchase in Adelaide when I visit. Not all caponate include eggplants. This Sicilian caponata is certainly different to the Christmas fare we are used to in Australia, but it makes a perfect antipasto or salad as an accompaniment to meat or fish . Eggplants and peppers are summer vegetables and not in season in winter for Christmas, so this caponata is made with celery hearts, traditionally boiled first before being sautéed. In some parts of Sicily green, leafy winter vegetables (for example chicory, spinach, endives) are also used with the celery. I do not pre-cook the celery; I prefer to slice it very finely and just sauté it till it is slightly softened. It is a very unusual caponata with a combination of textures and flavours –sweet, salty, sour… soft and crunchy. This recipe is one of the many caponate in my first book Sicilian Seafood Cooking. Sultanas or currants are both good to use. Muscatels and raisins are OK as well, but their size may not be as visually pleasing. Sometimes I toast the almonds, sometimes I do not. I made this caponata in a friend’s kitchen and on this occasion I used whole almonds rather than chopped ( the was no food processor/ kitchen wizz). On other occasions I have used pine nuts. I have paired this with meat and fish but I really like to eat it on by it self… especially at the start of a meal. Coarse Toasted Breadcrumbs, 2 tablespoons, made from good quality 1-2 day old bread and then toasted in a frypan with hot oil. Slice the celery finely and chop the leaves. Sauté the celery with the onion in a deep frypan until it has softened, add salt and cook for about 10 minutes. Add the olives, sultanas and capers and cook for another 2 minutes. Empty the cooked ingredients into a bowl. Agro dolce sauce (sweet and sour sauce): To the frypan already coated with caramelised flavours, add the sugar and heat it very gently until it begins to melt and bubble. Add the vinegar and allow it to evaporate. Add the vegetables to the sauce and some of the almonds, reserving some for decoration if you are not going to use the toasted breadcrumbs. Leave the caponata in the fridge, at least overnight. Serve at Room temperature. Top with the rest of the almonds or breadcrumbs when ready to serve. Caponata has evolved over the ages to become the dish, which personifies Sicilian cuisine and is a popular dish during festivities ( perfect for Christmas). As you’d expect, there are many regional variations and enrichments of what must have been a very humble dish, as well as the personal, innovative touches from the chefs of ancient, Sicilian aristocracy (called monzu, a corruption of the French word monseur). In Sicilian cooking the melanzana (eggplant) is said to be the queen of vegetables, second only to the tomato and the principal ingredient in caponata is the eggplant. If you eat caponata at my house you are likely to eat the version of caponata as made in Catania and it will include peppers as well as eggplant. This is because my mother was born in Catania and this is the caponata I grew up eating. The caponata which is common around Palermo has no peppers. I prefer to keep my caponata di melanzane simple, but again, variations in the amounts of ingredients are endless. Some versions add garlic, some have oregano, several recipes include anchovies, others add sultanas and/or pine nuts or toasted almonds. These are all acceptable and authentic variations. In keeping with the tradition of what is customary in Palermo, just before serving add a sprinkling of coarse breadcrumbs (toasted in a fry pan in a little hot extra virgin olive oil) or almonds — blanched, toasted and chopped. For me, Peter Robb in his book Midnight in Sicily captures the essence of a Sicilian caponata, when he describes how very different the caponata he was savouring in Palermo was to the caponata he had been eating in Naples. I realised caponata in Palermo was something very different. It was the colour that struck me first. The colour of darkness. A heap of cubes of that unmistakably luminescent dark, dark purply-reddish goldy richness, glimmerings from a baroque canvas, that comes from eggplant, black olives, tomato and olive oil densely cooked together, long and gently. The colour of southern Italian cooking. Caponata was one of the world’s great sweet and sour dishes, sweet, sour and savoury. The eggplant was the heart of caponata. The celery hearts were the most striking component: essential and surprising. Pieces of each were fried separately in olive oil until they were a fine golden colour and then added to a sauce made by cooking tomato, sugar and vinegar with a golden chopped onion in oil and adding Sicilian olives, capers ……. As Robb discovered: eggplant is the purple heart of Sicilian caponata – and it is the principal ingredient. There are a variety of caponate (plural of caponata) and the variations and inclusions of different ingredients in the basic caponata recipe are many. Some traditional recipes use tomato paste rather than chopped tomatoes, some add garlic, others include chocolate (or cocoa). Many recipes contain nuts – almonds or pine nuts or pistachio, fresh in some, in others they are toasted. In a few recipes the caponata is sprinkled with breadcrumbs and sometimes the breadcrumbs have been browned in oil beforehand. Frequently herbs are added – sometimes basil, at other times oregano or mint. Certain recipes also include raisins or currants and some fresh pears. Several include fish, singly or in combination and include canned tuna, prawns, octopus, salted anchovies and bottarga (tuna roe). You will need a deep, large fry pan. If you use a non-stick frypan you may not need as much oil, but the surface will not be as conducive to allowing the residue juices to form and caramelise as in a regular pan. (After food has been sautéed, the juices caramelise – in culinary terms this is known as fond. Non-stick pans do not produce as much fond). Although the vegetables are fried separately, they are all incorporated in the same pan at the end. When making large quantities I sometimes use a wok. Cut the eggplant into cubes (approx 30mm) – do not peel. Place the cubes into abundant water with about 1 tablespoon of salt. Leave for about 30 minutes – this will keep the flesh white and remove any bitter juices while you prepare the other ingredients. Although it is not always necessary to do this, the eggplant is said to absorb less oil if soaked previously. Prepare the capers – if they are the salted variety, ensure that they have been rinsed thoroughly and then soaked for about 30 minutes before use, and then rinsed again. Slice the celery into very fine slices and chop the green leaves. Peel, and coarsely chop the tomatoes (or use tomato paste or canned tomatoes). Drain the eggplants and squeeze them to remove as much water as possible – I use a clean tea towel. Heat a large frypan over medium heat with ½ cup of the extra virgin olive oil. Add eggplant cubes and sauté until soft and golden (about 10-12 minutes). Place the drained eggplants into a large bowl and set aside (all of the vegetables will be added to this same bowl). Drain the oil from the eggplants back into the same frypan and re-use this oil to fry the next ingredients. Add the celery and a little salt gently for 5-7 minutes, so that it retains some of its crispness (in more traditional recipes, the celery is always boiled until soft before being sautéed). Remove the celery from the pan and add it to the eggplants. Sauté the onion having added a little more oil to the frypan. Add a little salt and cook until translucent. Add the tomatoes or the tomato paste (with a little water) to the onions, and allow their juice to evaporate. Add the capers and olives. Allow these ingredients to cook gently for 1- 2 minutes. Empty the contents of the frypan into the other cooked vegetables. Add the sugar to the frypan (already coated with the caramelised flavours from the vegetables). Heat it very gently until it begins to melt and bubble. Add the vinegar and allow it to evaporate. Incorporate the cooked vegetables into the frypan with the agro dolce sauce. Add ground pepper, check for salt and add more if necessary. Gently toss in all of the cooked ingredients over low heat for 2-3 minutes to blend the flavours. Remove the caponata from the pan and cool before placing it into one or more containers. Store in the fridge till ready to use and remove it from the fridge about an hour before eating– it will keep well in the fridge for up to one week. When ready to eat, sprinkle with either toasted almonds or toasted breadcrumbs. I like to add fresh basil or mint leaves. In Sicilian cuisine there are a number of recipes, which include chocolate to enrich the flavour of a dish (see HARE or RABBIT COOKED IN CHOCOLATE) and chocolate in eggplant caponata is a common variation in certain parts of Sicily. In the early 1500s, the Spanish conquistadors discovered a variety of unknown foods in the New World.Among these was xocolatl, (chocolate) obtained from ground cacao seeds. Spanish nobility arrived in Sicily during the 15th and 16th centuries and they brought their exotic ingredients from the New World to the island. This was also an ostentatious period of splendour and opulence for the clergy and the Sicilian aristocracy. Although many traditional Sicilian dishes are said to be Spanish legacies, it is more accurate to say that some Sicilian cuisine incorporated both Sicilian and Spanish traditions. Follow the recipe for eggplant caponata above and add cocoa or good quality, dark chocolate. Cocoa: The majority of the recipes for caponata enriched with chocolate suggest the use of cocoa powder (about 2 tablespoons of cocoa to 2 tablespoons of sugar dissolved in a little water to form a thick paste). Add this mixture to the pan after you have made the agro dolce sauce and before you add the cooked vegetables. Dark Chocolate: My most favoured alternative is to use 50g of dark, extra fine chocolate (organic, high cocoa content – 70%). Add the chocolate pieces into the agro dolce sauce and stir it gently as it melts, and then I add the cooked vegetables. This results into a much smoother and more luscious caponata. In a modern Sicilian restaurant with a young chef, I was presented with an eggplant caponata where the chocolate was grated on top, much like grated cheese on pasta. Anchovies are often added to fish in Sicilian cuisine – they are either stuffed in the slashes made on the sides of the fish or gently melted with a little oil and added to the fish whilst it is cooking. Trout has flaky, delicate flesh and slashing it is not a good idea so I chose to do the latter. I always use herbs for all my cooking and this time I selected sage that is often associated with veal and pork but I quite like it with trout. Sage is not a common herb in Sicilian cooking and you may prefer to use rosemary instead. Prepare the fish – clean, dry and stuff a few herbs in the cavity. Add a little oil (about one tablespoon depending on your pan) to the frying pan and over medium heat. Add the lemon slices and pan fry them until lightly browned – turn once. In order to brown the lemon slices they should not be overcrowded so you may need to pan fry them in two batches. Remove the lemon slices from the pan with the oil and any of the juices. Add a little more oil to the fry pan, heat it and add the anchovies. Stir them around in the pan over medium-low heat until they dissolve. Add the trout. Sprinkle with salt and pepper (remember that the anchovies are salty) and add the sage. Pan fry the fish on both sides and only turn once. Add the olives half way the cooking. Toss the slices of lemon and the juices back in the pan and heat through. When I was in Paris a couple of months ago I saw this hand painted Fridge in a store window. This fridge is part of Sicily is my Love, a colourful collaboration by Smeg fridges and Dolce&Gabbana’s signature decorative style. Each of the 100 fridges illustrate Sicilian folklore in bold, vibrant colour and are hand-painted by Sicilian artists. They were released during the Milan Design Fair, Salone del Mobile di Milano in 2016. This year’s olives…… hardly worth it. Larger than last year’s crop, but probably just as few. I think that my tree is refusing to produce many olives because it is objecting to being in a pot. It gets root bound and every year we pull it out of the pot and trim the roots – this probably traumatizes it. It has given me many years of pleasure and I have certainly experimented with processes for curing the olives and dressing them. Once pickled, my olives do not keep their colour – I pick them when they are a green- violet colour but the pickling process turns them into a uniform light brown colour. A statement by Interpol on Wednesday said a record 10,000 tonnes and 1 million litres of hazardous fake food and drink had been recovered across 57 countries, with Australia also making the list. Italian olives painted with copper sulphate solution, Sudanese sugar tainted with fertiliser, and hundreds of thousands of litres of bogus alcoholic drinks top Interpol’s annual tally of toxic and counterfeit food seized by police agencies across the world. The haul of bogus diet supplements, adulterated honey and ……….etc. I have often been asked about the colour of Sicilian Olives (those bright green ones as in photo above) and I really do not know how they are pickled and how the bright green colour eventuates. My tree has given me a great deal of pleasure and I have certainly experimented with processes for curing its olives and dressing them. The olive trees in Agrigento are among the oldest in Sicily. This photo was taken in the Valley of the Temples. Oh, to be in Agrigento now! POLLO OR GALLINA ALLA CONTADINA, ALLA PAESANA. Braised Chicken with Olives, Sicilian style. Any time you see Italian dishes described as alla contadina, alla paesana, alla campagnola………do we really know what is meant by these terms? These all translate as of the peasantry – peasant style – and as those who live on the land would cook these dishes. They imply to be dishes that are healthy, nourishing, unsophisticated, hearty, country-style and as cooked at home. In these dishes you would also expect some common vegetables – onions, carrots, celery, some common herbs and wine (someone living on the land usually makes their own wine). Carne – meat, or coniglio – rabbit, or pollo or gallina, seem to be cooked alla contadina, alla paesana, alla campagnola very frequently in home kitchens. The method of cooking is braised or stewed. What is meant by pollo and gallina, and is there a difference? Pollame are farmyard birds, therefore pollo is derived from this word. Gallina is chicken and female. Gallo is the masculine, i.e. a rooster and would probably be not as tender as a gallina and would require more cooking. Once a pollo would most likely have been considered a male, but in modern times there is no difference between the terminology or the gender and especially in Australia, UK and US, it is what we commonly refer to as chicken. Usually chicken is 6-12 months old when it is killed. A gallina vecchia would be the description of a chicken used to make broth/ stock and would be older than 12 months. Cappone is a capon and is a castrated male – this is likely to be sold as a larger bird as it will be fattened intentionally; the implication is that it will be tasty. I doubt if I could purchase a capon in Australia. Recipes for pollo or gallina (chicken) alla contadina etc. cooked with these simple ingredients and braised are found in every region of Italy; the only variations may be the addition of a few tomatoes or mushrooms or a pepper (capsicum) or two. The wine can be red or white. I always buy whole chicken for a braise. My mother and relatives always did and I guess I just do without question. Although I always buy free range, there is always some fat and I remove as much as possible before I cook it. I also always skim fat from the top of the braise once it is cooked. As you can see by the way I dissect the chicken into pieces, I am no butcher, but if it is peasant style after all so I get away with it being roughly cut. I usually cut rough the vegetables as well. And who needs exact measurements if the recipe is home style. Cut the chicken into pieces and remove the fat (unless you like fatty chicken). Brown the chicken in a tiny amount of oil – one side and the other. Remove from the pan. I like to drain off any fat before I continue cooking the rest. Use the same pan, add the olive oil. Sauté the onion. Add celery and carrots and sauté some more. Add the chicken, herbs, tomatoes, seasoning and pour in the wine. Do not use much salt as the olives are likely to be salty. Add some water to almost cover the chicken, cover and braise the contents (on low heat) for 40-60 minutes, stirring now and again. Add the olives about 10 minutes prior to the finish. If there is too much liquid and you wish to concentrate the flavours, remove the chicken, increase the heat and evaporate the liquid lid until it has thickened. At this stage I skim more fat from the top if it is necessary. Add the chicken, mix, cover and leave until ready to serve. Remember, Italian food is not usually presented at the table piping hot; the flavours are left to mature for at least 30 minutes.Italians like to savour their food and not have scalded palates! Just recently one of my Adelaide friends made a salsa verde to accompany some lightly roasted sirloin and roasted vegetables. Most enjoyable. Making salsa verde was one of my tasks as a teenager in the family kitchen. There always seemed to be some salsa verde in our fridge; it was used specifically as a condiment for our frequent serves of pesce lesso, (poached or steamed fish) and bollito (boiled meat). Broth (and hence boiled meat) was a weekly affair. Traditionally it was intended to accompany plain tasting, boiled food. I was very surprised that I have not included a recipe for salsa verde on my blog as I make it often. I have never measured or weighed ingredients when making sauces, but these estimations seem to produce what I am after. Allow this salsa to rest for at least an hour so that the flavours become better balanced. Traditionally the consistency of the sauce is semi liquid, especially if you wish to pour it over fish or meat. However, by adding larger amounts of solid ingredients, this sauce can be presented as a large blob on the side of the meat or fish. To serve the salsa verde with fish, I sometimes use lemon juice instead of vinegar. In latter years I also started to add grated lemon peel. Recipes evolve and over time, especially in other parts of the world where salsa verde has been become popular and different herbs have been added. For example I have noticed that mint or tarragon or oregano or rocket have snuck in. These herbs are not common in the traditional Italian recipe that originated in the north of Italy but has spread all over Italy. In Sicilian it is called sarsa virdi . Salsa verde can be used to jazz anything up – vegetables, roasts, cold meats, smoked fish, crayfish etc. I sometimes use it to stuff hard boiled eggs (remove the yolk, mix with salsa verde and return it to the egg). I had someone ask me recently about using it with left over Christmas turkey. Why not? Soak the bread briefly in 1 tablespoon of the vinegar and squeeze dry. Combine all of the ingredients and stir them gently together in a wide mouthed jar or jug. The anchovies generally provide sufficient salt, but taste the sauce and season to taste. When I lived in my parent’s house a little of the mixed garden pickles (called sotto aceti or giardiniera) was a must. Select a couple of small pieces of the white root (turnip) or green (small gherkins). Omit the ½ tablespoon of vinegar. This is the type of sauce where you can vary the ingredients. Add different amounts of ingredients – more or less anchovies or capers.